Just want to walk? 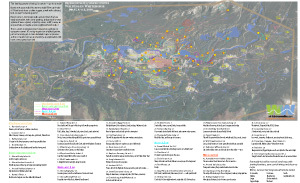 LOOP WALKING TRAILS, 100+ walks, 100s kms of trails to tempt locals and tourists. WhitehorseWalks works to make walking more attractive, more intriguing, to get more people out on the trails. The Hepburn Tramway is a recent whitehorseWalks project (Small addendum page). April 4, 2019. A brochure about our Third & Hawkins project. July 19, 2018. A walker's delight... Third & Hawkins presents a new choice in downtown condo living for Whitehorse. I've been working with a few others to build this project in the walkable, residential, south end of downtown. A very energy efficient building, it'll be bright, spacious, have great views — and, we just signed the construction contract! We can't wait to move in. Units still available. April 14, 2019. I heard by the proverbial grapevine that there was federal funding looking for shovel-ready trail projects. I thought I'd respond with some things I see as we walk around Whitehorse. 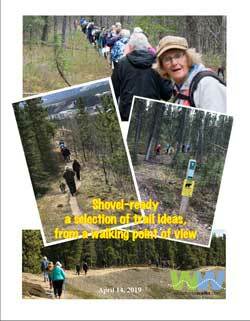 I called it Shovel-ready, a selection of trail ideas from a walking point of view. Stuff for walkers, runners, and bicyclists as we share the same trails! Feel free to suggest other things. April 14, 2019. The healing power of being in nature — go for a walk! Bored with your walks? No time to walk? Think lunch hour or after supper, a walk with a friend, kids, or if hosting guests and want to dazzle them! Here's some 1-3-km loop walks around town that are easily accessible, with some parking, and provide a treat: a pond, a spot by a river, a cliff, a view, an unusual hike, or maybe a nice neighbourhood walk...? March 7, 2019. Range Road extension and walking. My YESAB submission. March 4, 2019. Teen helped off clay cliffs A teenager rescued from the clay cliffs Sunday was not injured, the Whitehorse Fire Department said this morning. This is the area the downtown south area development scheme says needs a staircase. February 20, 2019. Short Loop Walks The healing power of being in nature — go for a walk! Bored with your walks? No time to walk? Think lunch hour or after supper, a walk with a friend, kids, or if hosting guests and want to dazzle them! Here's some 1-3-km loop walks around town that are easily accessible, with some parking, and provide a treat: a pond, a spot by a river, a cliff, a view, an unusual hike, or maybe a nice neighbourhood walk...? Next OCP is in process. This one will be for 20 years!!! So it's a good time to think about your ideas on community values. How can we up the ante on walkability? Are there things we can do to make a more vibrant downtown? There were 653,808 ED visits reported for injury after unintentional falls in Canada, accounting for 32% of all reported ED visits for injury and trauma. November 19. 2018. Pedestrian & Bike Underpass of Alaska Highway? The recent paved trail along the airport unfortunately focused a pedestrian crossing need at Burns Road. Realistically speaking, neither the airport nor Spook Creek Gulch will change locations so the crossing to downtown makes most sense where Forest points out. This fits nicely with Concept A of the 2012 Tank Farm workshop the owners of the Tank Farm held with residents. It seems fitting that the most historical group of local walkers, local First Nation people, many of whom live in the McIntyre subdivision, would benefit hugely from this location. For walkers coming from downtown to the CGC this location is also well situated. Looking at the Tank Farm plans and green space available outside the Tank Farm, for Hillcrest residents, accessing this underpass from the west side of the highway makes so much more sense than the Burns Road/Roundell/Hillcrest Drive options. This underpass should not be confused with the desperate need for traffic lights along the highway in Hillcrest. November 17, 2018. Attention Whitehorse: shovel your sidewalks YES!! The city that gives you free beer for cycling This is how the Italian city of Bologna is getting people to leave their cars behind. October 14, 2019. Fun read on Paul's thinking behind some of our local trails: GNAR WALL story of a build 2016-2018. It's an election year, and a current study is a parking study.... Hmmm! Ask your candidates what their vision is for walking. More parking lots, bigger roads so people can drive downtown quicker? July 27, 2018. Here's some wheelchair/walker/stroller-style places to go. I'll work more on this but here's a start. July 1, 2018. Happy Reckless Raven day! We did our Cheer on the Ravens Hike. The Ravens ran the big loop! June 23, 2018. What the happiest places have in common Citizens’ wellbeing is often the result of careful planning—not serendipity. Draft: Yellow Green BoogaLOOP, 4.6 which our ElderActive group hiked on Tuesday and quite liked. March 27, 2018. What counts as 'real' city planning? The traditional canon of urban planning excludes people and practices that could greatly benefit it—and society. That needs to change. "It is time to recognize that our shared identity as planners is based on privileging the contributions of certain individuals and groups over others." March 15, 2018. Here's my submission to the Parks and Recreation Master Plan process. The distinctions between shared use trails and those designed specifically for mountain biking access are explored. February 26, 2017. Here's a short loop with variety: Yellow Brick Road-El Camino-My Trail. January 11. 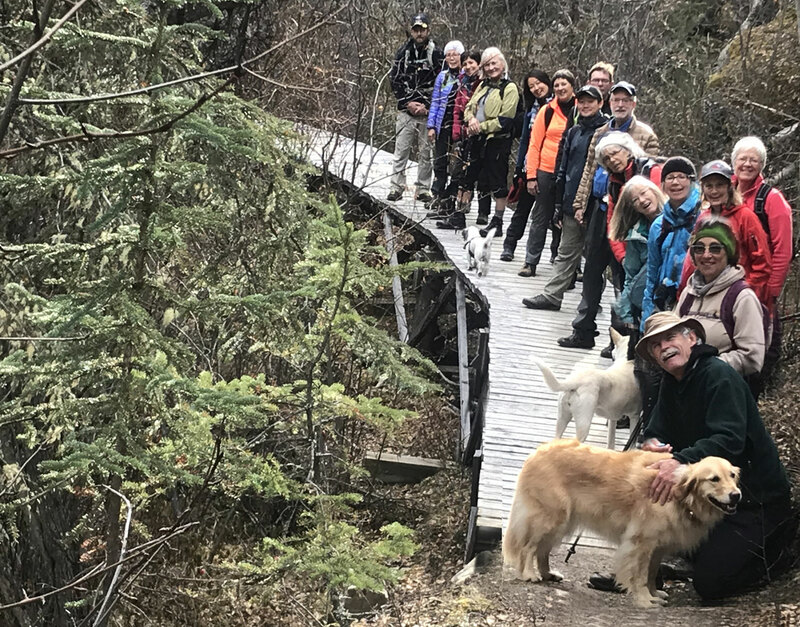 Yukoners invited to help the Government of Yukon and the City of Whitehorse improve public engagement ...what we can do to better engage with the public and help us to become more accountable, transparent and responsive. January 5, 2018. How ‘Not in my backyard’ became ‘Not in my neighborhood’ The expectation that homeowners should be able to reach beyond their property lines has become deeply embedded. When we travel I really like to walk well designed paths done in rock. So Johnny Clasper carefully places stones to create amazing works of art is a great look at rock and design. 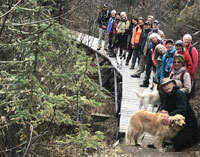 New to walking Whitehorse trails? Winter: Lee Valley Ice grips; Pacerpoles + gloves.